Stampin' Up! My Friend: an Australian 2011-2012 Idea Book and Catalogue sneak peek! Hello again. Time for a new catalogue sneak peek don't you think? This set was one we received at Managers reception at convention in May. It's a lovely set and I particularly love the swirly foliage stamp (which for some unexplained botanical reason is growing sideways in this card!). This is one of my favourite colour combinations: Crumb Cake, Blushing Bride, Rich Razzleberry, Very Vanilla and Early Espresso. I have used my 2 step bird punch for the branches, and the Floral Fusion sizzlit with my Big Shot for the flower. This is such a cute little die! Just a quick reminder that if there is anything in the Stampin' Up! Autumn Winter Mini catalogue that you can't live without, you had better be quick as the sales of these products end tomorrow at midnight. There's no guarantee anything will carry through to the new catalogue (and as demonstrators we don't know until after this mini catalogue closes). I'm around tomorrow and tomorrow night to take your order, so email me or call me on 03 9735 2946 and I'll put your order straight in. You can view the catalogue online here. This means it's also your last chance to buy the fabulous Strength and Hope stamp set of which $2 of every sale goes to breast cancer research. 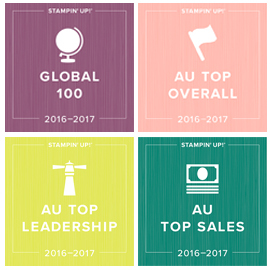 I can't wait to update you on how much the stampers of Australia have raised. 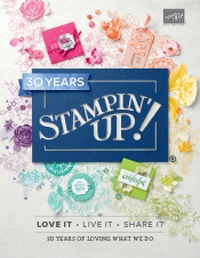 It's such a pleasure to work for a company as giving as Stampin' Up!. It's also your last chance to get your hands on the Autumn Spice Designer Series Paper and Clearly for You stamp set. A free tutorial package for all these cards using these two products can be yours if you buy either of these products between now and tomorrow night! I hope that's given you a good reminder of some of the products that we may be saying goodbye to forever from this mini catalogue. If there's something you have to have, email me or call me on 03 9735 2946 or 0412120498 and I'll put your order straight in. You can view the catalogue online here. Don't forget to check back Monday as there will be some exciting updates about the retired products list and I can start selling new catalogues for delivery when my preordered copies arrive - yeah! So much excititment. Now I am off to make a very much from the heart card. I'll share it with you during the week. Another bright card for you today, this time using the cute little birds from Stampin' Up! Cheep Talk stamp set. You can get step by step instructions from me for 6 cards just like this one and also a bright and happy Perpetual Birthday Calendar in my Brighten Up Winter Tutorial Package. This package is available free with a $100 order up to July 31st (which also gets you the free ribbon and buttons used). If you have the supplies or your own demonstrator, you can also buy just the tutorials and find out how to make these 7 projects with any cardstock colour group, by popping over to my tutorial page here. Today I just have another quick card for you, a card I made for a party Josh attended Friday after school for one of the girls in his class. She loves butterflies and bling, so this was another easy quick card. Quick is good though right? My colours are Rich Razzleberry, Pretty in Pink, Baja Breeze and Old Olive. Pretty straightforward this one - just lots of embossed butterflies using the Stampin' Up! Beautiful Wings Embosslit and my Big Shot. A few adhesive rhinestones for the centres, and a scalloped trim border which I have made a bit shorter so I could place a strip of Pretty in Pink striped DSP behind it to highlight the edge. 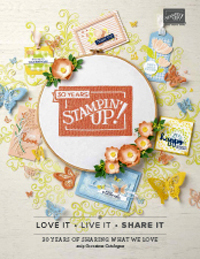 The greeting is from Stampin' Up! Curly Cute and is embossed in white. I've spent some time creating this weekend, although need to wait a little longer to show you these projects as I want the recipients to get them first. I've also been charging the camera batteries and printing off the worksheets ready to record a week in our ordinary life along with others via Ali Edwards Week in Your Life project. I've been following Ali for 7 or 8 years now would you believe? 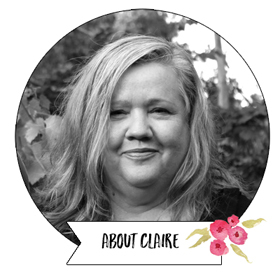 I just love her approach to memory keeping and her focus on everyday life and everyday memories using whatever products you like. Very inspiring! I hope to pop in and let you know how my project is going duiring the week. I'm also enrolled in Ali's One Little Word project this year and have been working on that project this weekend too. I started strongly and then I got a little stuck because some of the monthly tasks weren't 'me', but after some thought about what I wanted to get form this, I am off and running again with some changes to personalise the project a bit. I'm doing lots more random stuff about my word 'nourish' and have so many ideas floating in my head. This weekend I have been doing some 'evidence of my word' pages and when they are finished during the week I will share them too. Other than that it's been a nice quiet family weekend which I love. Josh made some cupcakes, we watched some great sport, we laughed at Oscar and his crazy antics (hasn't he grown?). I feel like I have a pretty good balance in my life at the moment surrounded by people and things that make me happy and nourish me. Things I thought I needed last year I no longer aspire to but I feel challenged in so many new and positive ways. Calmer and happy too and I love that I am scrapbooking so much more. I picked up this lovely Donna Downey plaque at my weekend away which I was instantly drawn to for it's nourishing words. It's sitting where I see it on the way into the kitchen each morning and it makes me smile. Thanks for listening to me ramble into cyberspace. Peace sister, lol. This is why I love Stampin' Up! products - so super easy to create quick coordinating cards with the matching colour products. I made this baby boy card in 15 minutes using Stampin' Up! Baby Tees Jumbo Wheel. One of my school Mum friends (where would we be without them?) just had her 5th baby. Now I know that deserves a medal not a card, but stamping is what I do! The exciting news is that this baby was a boy after 4 girls, so we needed to start introducing some blue into that house! I took this card around with a little present after dropping her girls home from school this week (that's the real present, doing the school run for her :) ). I chose a nice bright Tempting Turquoise and my trusty Stampin' Up! Colour Coach (where would we be without that too?) told me Tangerine Tango was a great choice as a highlight colour. Love these colours together. I just stamped the Baby Tees Jumbo Wheel in Basic Black onto some Tempting Turquoise prints paper and cut it out with my paper snips. A few dimensionals and stars on the background and we are done. For my effort I got to cuddle the gorgeous little baby Mark while he slept in my arms. So cute! I'll be aiming to sneak some more cuddles on another drop off day!